This post is going to be short and sweet, but very helpful if you’re new to Squarespace. 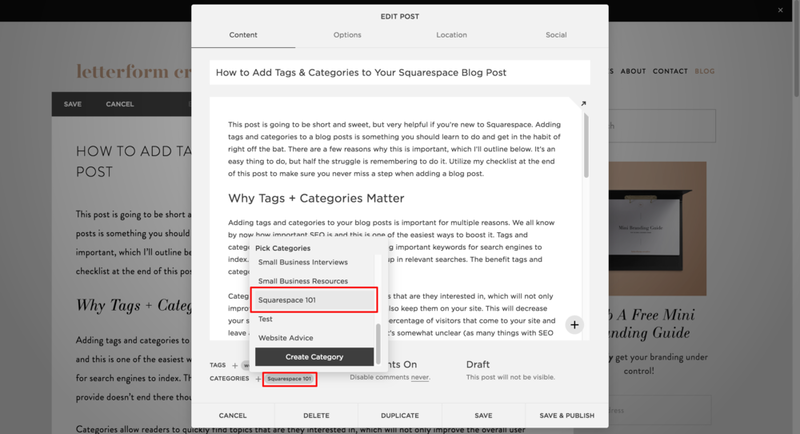 Adding tags and categories to blog posts is something you should learn to do and get in the habit of right off the bat. There are a few reasons why this is important to do, which I’ll mention below. Fortunately it’s a pretty easy once you get the hang of it. 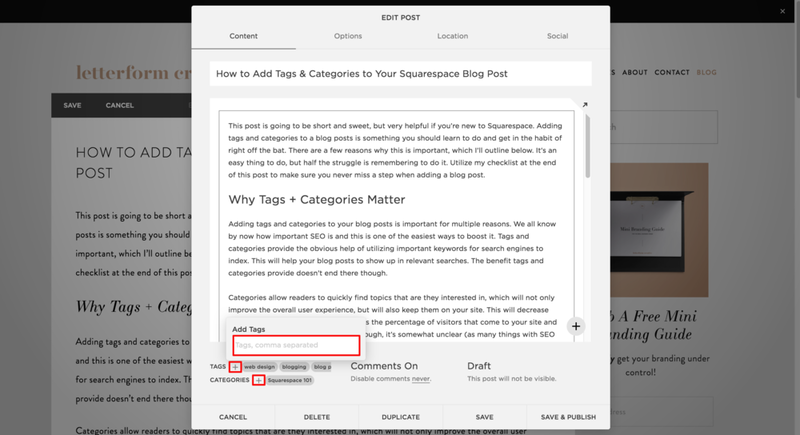 Adding tags and categories to your blog posts is important for multiple reasons. We all know by now how important SEO is and this is one of the easiest ways to boost it. Tags and categories provide the obvious help of utilizing important keywords for search engines to index. This will help your blog posts to show up in relevant searches. The benefit of tags and categories doesn’t end there though. Categories allow readers to quickly find topics they're interested in, which will not only improve the overall user experience, but will also keep them on your site. This will decrease your site’s bounce rate. A bounce rate is the percentage of visitors that come to your site and leave after only visiting one page. Although, it’s somewhat unclear (as many things with SEO are), it is possible that having a high bounce rate might negatively affect your SEO. So it certainly doesn’t hurt to lower it if you can. Bonus Tip: If you're using a Squarespace template that allows for a blog sidebar, take advantage of this by putting your categories in there for visitors to quickly see. Now that you are aware of the importance of tags and categories, let’s start making use of them! Add a new blog post or edit an existing one. Not sure how to do that. Find out here. In the bottom left corner select the plus sign next to categories. If you've added tags before, once you start typing past tags will pop up. You can select those or add new ones. With categories you will see a pop up menu of all the categories you've used before. If you don’t have any saved yet, then you will have to create a new one. Type it in and hit enter. If you're selecting from pre-saved categories this is where it can be a little finicky. Highlight the category you want (make sure you only click once or you will deselect it). When you see it show up next to the plus sign (see the screenshot below) you'll know it's selected. Instead of pressing enter just click away from the dropdown menu. Make sure the category is still appearing next to the plus sign. Then go ahead and save your post. To help you remember to add these to every blog post (and for some other important SEO boosters) use the checklist below before you hit publish. Add headings within your content. Add and test all hyperlinks. Add relevant images, screenshots, or videos within the post. Customize the file name of all images in your post with search-friendly terms. Add alt text to all images and videos. Learn more about that here. Schedule or publish your post! I'm a huge fan of Squarespace and love how use-friendly it is, but that doesn't mean there isn't a learning curve, even for the most tech-savvy among us. If you have a Squarespace question of your own, post in the comments below and I'll be happy to make a tutorial!